A select group of family members began spending Thanksgiving at the farm of my Aunt Roberta and Uncle Bob sometime in the early 1980s. In the beginning, the number of attendees filled the chairs around a large oak dinning room table. The group included my aunt and uncle and their three sons, my mother, my brother Steve and wife Sandy plus children and grandchildren, and me. The table’s top featured numerous crocheted doilies covered by a piece of clear plastic. Roberta spent much of her time cooking, crocheting, quilting and doing farm chores. These doilies represented some of her finest work. A quilting frame, holding Roberta’s latest quilt, sat nearby showing minute, precise hand stitching. Roberta’s legend as seamstress dissipated when compared to her fame as a cook. My mother, whose cooking depended on her mood, loved to “drop in” at her sister’s farm around dinnertime. Roberta, unfazed by the increased number of people around the table, peeled a few more potatoes, opened another can of vegetables and figured a way to stretch the meat. The dinner appeared as if she planned the number of dinners. Her sons, John, Glen and Gary, learned kitchen skills from their mother as they grew into men still living at home and unmarried. John was the only one of the three that married, but he and his wife parted after the birth of a daughter. Aunt Roberta called on her three sons to assist in the preparation of our annual Thanksgiving feast each year, with their main contribution the turkey cooked on a rotisserie located in a shed near the house. The rest of us brought our share of the fare as well and waited patiently for the turkey, which debuted each year with a crisp-golden exterior and juicy, tender interior. Dinner took less time to devour than to cook, but we sat satisfied afterwards, basking in our fullness and waiting for dinner to settle so we could indulge in the pies, at least one of those pumpkin, that beckoned to us from the counter where they sat filled with goodness. Some years, Aunt Roberta added a chocolate cream pie to the mix, other years she presented her famous pineapple cream. Whichever kind she decided upon, it always came with a thick covering of light meringue accented with golden peaks. As time passed, the numbers around the table began decreasing, first by the leaving of children to other lives in other states, then with the death of my mother in 1997. Uncle Bob followed a few years later and then Aunt Roberta. Next came the deaths of my brother Steve and cousin John, both in 2009. For the past two years, the four that remain, myself, my sister-in-law Sandy, and cousins Glen and Gary, continue to gather around a much smaller table, not yet ready to let go of the tradition. The meal remains much the same, turkey, dressing, mashed and sweet potatoes, gravy, olives, stuffed celery sticks, deviled eggs and, of course, green-bean casserole. This past year, Glen opted to prepare a turkey breast in the oven; not quite as splendid as the rotisserie-cooked bird of old, but still crispy and juicy. The pies, pumpkin and this year pineapple cream, still beckoned us after our meal. We remain grateful for each other’s company and the memories left by those who now join us only in spirit. 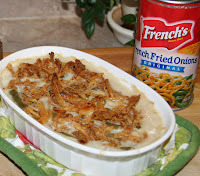 Sandy cooks the green-bean casserole each year, preparing it according to the recipe provided on the container of French’s French Fried Onions. The original recipe calls for canned mushroom soup and canned green beans. It is one of my favorite vegetable dishes, but a full recipe makes more than I need for one person so I set out to make my own version, which can feed two at one meal or one person with some leftover for a second meal. 1. Sauté mushrooms in butter or oil over medium-high heat until all moisture evaporates, 5-6 minutes. 2. Stir in flour and continue to sauté one minute longer. 3. Stir in milk and bring to a boil, stirring constantly. 4. Stir in the green beans and 2 tablespoons of the French Fried Onions. 5. Pour mixture into a 15-ounce oval baking dish coated with cooking spray. 6. Bake uncovered in a 350°F oven for 20 minutes. 7. Spread the remaining French Fried Onions over the top and bake 5 minutes longer. Serve piping hot.